What the younger lawyer failed to realize at that point is that the first row in court is always reserved for the Senior Advocates and any other lawyer may only sit there if there are no senior advocates in court or upon the express invitation of the Learned Silk who occupies the first row or the Judge. Most times, SANs would invite other lawyers to share the inner bar, especially when the court was full and there were hardly any seats left for other lawyers. On the other hand, there are a number of Senior Advocates who would not share the inner bar with other lawyers who have not attained the status and priviledge. “​You were obviously chosen from the large number of applicants based on your outstanding qualities of, inter alia, intellectual fecundity, hard work, diligence, unparalleled advocacy skills, sense of purpose, consistency, integrity and not least, humility. I include "humility" amongst the qualifying attributes because, sometimes, our colleagues of the Inner Bar tend to forget that the rank of SAN is best worn with and in humility. Humility, in general terms, exalts the person. 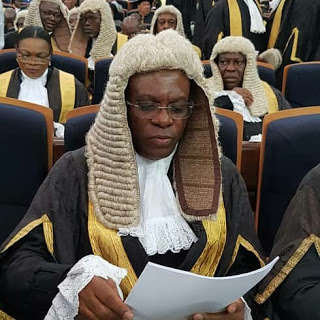 In specific terms, humility stands out and elevates a Senior Advocate of Nigeria – to wit, humility to the Courts, humility towards your colleagues of the Inner and Outer Bars, humility towards your clients and indeed humility towards members of the public.